Sally Ride, the first American woman to fly in space, died on Tuesday, July 23rd at the age of 61. Inducted into NASA’s Astronaut Corps in 1978 as part of Group 8, she flew on Space Shuttle Challenger for STS-7 in 1983 and STS-41-G in 1984. After Challenger was lost in an explosion in 1986, she served on the Rogers Commission investigating that incident. She retired from NASA in 1987. In 2003, she was a member of the board investigating the Space Shuttle Columbia accident, becoming the only person to be on both committees. After that… well… if you really want to know what she did between 2003 and now, you can find it in one of the prevalent biographies of her found at public libraries and on the Internet, as I’m not entirely sure myself. I first discovered Sally Ride in late 2007 or early ’08, when I chose her to research for my Destination Imagination team’s Challenge that winter. Although I never met her, I admired her, and I was shocked and saddened to learn of her death. 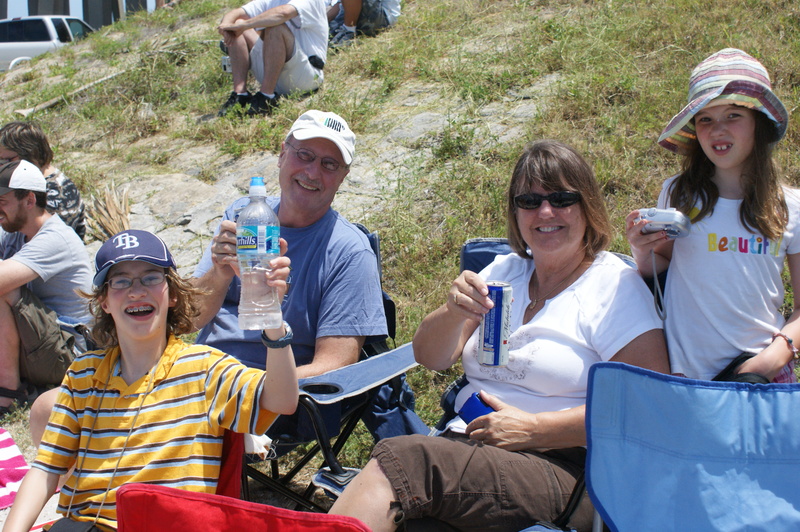 On May 14th, me and my mom and my sister, Winnie, and my grandparents went to see a Space Shuttle launch. We were 14.2 miles away but could see the contrail very clearly, i.e. it was not a thin streak, it was really kind of thick until the Shuttle was very far away and probably out over the ocean. 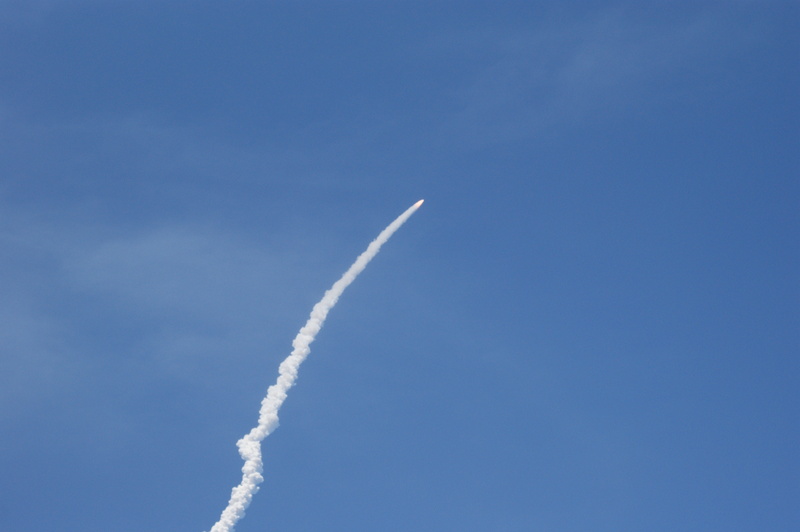 Eventually the contrail just disappeared, as it was the exhaust from the solid rocket boosters, or SRBs. By disappeared, I mean that the contrail was still there but trailed off into the distance and then stopped when the SRBs separated from the Shuttle Orbiter and attached External Tank (ET). The Shuttle is actually made up of 3 main parts: the SRBs, the ET, and the Orbiter. The SRBs, which separate around 2 minutes after liftoff and land in the Atlantic, where they are retrieved, are filled with a mixture of ammonium perchlorate oxidizer and aluminum fuel and a few other things which I am not going to mention here. The shuttle looked like an enormous fireball because all we could see was the flame from the SRBs. The ET, which consists of a liquid hydrogen tank (fuel), liquid oxygen tank (oxidizer), an intertank section, and an outer casing that encloses the whole thing, is released when the Shuttle leaves the atmosphere and it burns up as it falls down to Earth. Finally, there is the Orbiter, which is what most people think of when they hear the word Space Shuttle. This is the only part that actually orbits Earth, hence the name. There are 3 Orbiters, which are called Atlantis, Discovery and Endeavor. The Orbiter that we saw launch was Atlantis. This was the last planned launch of the Atlantis orbiter. I just can’t explain how it felt to see the launch, except that it was amazing. The sound took a long time to reach us because we were very far away from the launch pad. It sounded like thunder, except that it went on for a long time. Watching the shuttle was exciting. I have never seen anything like it. It was inspiring. The space shuttle Endeavour docked with the International Space Station at midnight on Wednesday to deliver a new module. The module, called the Tranquility node, is 15 ft wide x 23 ft long. Inside Tranquility, there is a bathroom with a system to recycle urine into drinkable water and also a system for removing carbon dioxide from the air so that the astronauts can breathe. Attached to Tranquility is the Cupola, a dome-shaped extension with 7 windows for Earth observation. The Cupola offers a 360-degree outlook on space, which is new to the ISS. The other day, we heard an interview on NPR with an astronaut who was very excited about that. NASA is going to retire the shuttle after 2010. In his budget, President Obama encouraged NASA to look forward and use private companies to build spacecraft to put astronauts into orbit. I was going to do this post on NASA’s Constellation program, but it was using old technology and went and got itself canceled earlier this week, so I don’t see much of a point. I’m not sure whether or not I think that using private companies is a good idea. What’s your opinion on this and on Tranquility? UFOs (Unidentified Flying Objects) are things in the sky that have no apparent explanation. Sometimes they are clouds, & sometimes they are other things. Some people believe that UFOs are visitors from space. Some UFOs are hoaxes or jokes. Some are weather balloons or airplanes or other man-made objects. Others are flocks of birds. Still others have no explanation whatsoever. My dad said “the probability that aliens have visited the earth in spacecraft is precisely zero.” I think that it is possible that a highly advanced alien civilization could visit earth in advanced spacecraft and people might see them. What do you think about UFOs?